The Farm at Beaman's Fork: Peep! Peep! We are still waiting to see if one remaining pipped egg in the incubator will hatch today on day 23. It's well pipped (has been for about 18 hours) and the chick inside is moving & peeping. Three other eggs in the incubator have yet to pip and may not be viable, but will give them until this afternoon to show signs of life before we cull them. Black Copper Marans hen: Resulted in 5 full bred Black Copper Marans chicks. This hen lays very dark chocolate brown eggs and has a nice bulky body type. We hope to get some good dark egg layers and have bulky roosters that are adequate as meat birds. Ameraucana Hen (Blue egg layer): Resulted in 3 (**Update: 4!) Ameraucana/Black Copper Marans cross chicks. Reliable layer, good egg color. Crossing a BCM rooster with a blue laying Ameraucana will hopefully give us Olive Eggers (hens that lay a olive or khaki colored egg). She's not a bulky bird but since our BCM rooster has a big bulky body style and a fast grower, we can probably use resulting roosters as meat birds. Ameraucana Hen (Pink egg layer): Resulted in 3 (**Update: 4!) 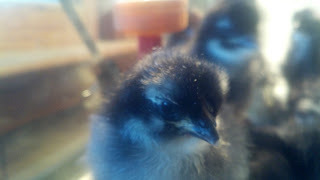 Ameraucana/Black Copper Marans cross chicks. Even though this Ameraucana hen doesn't lay the typical blue eggs, she is an egg machine. She has been ab extremely reliable daily layer since day one, and we hope to continue that trait in her chicks. She is also a big, bulky bird that should result in bulky roosters adequate for meat birds. These 11 (**Update: 13! See note below) chicks are in addition to the 8 that we hatched out in January. We plan to raise them all to laying age (separating roosters for either selling or processing as meat birds) and decide on our keepers (no more than 6 total). Then later this year we will sell off the rest of the pullets as starter birds. Thank you to everyone who tuned in and watched our chicks hatch live online! It was a fun weekend and I am glad we were once again able to share it with so many people. **UPDATE: We had THREE eggs hatch on days 23 & 24, bringing our grand hatched total to 23 (13 for us, 10 for my friend Autumn).